If you’re looking to add a splash of color to your aquarium, there’s no better way to do so than by adding a few Peacock Cichlids. These bright and vibrant fish are native to Africa’s Lake Malawi, and are some of the friendliest, most easygoing fish in the world. If you’ve often wondered whether your aquarium would be a good habitat for a Peacock Cichlid, the answer is likely a resounding yes. 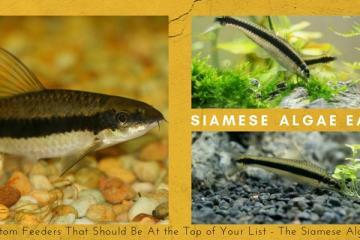 With just a little bit know-how and understanding, you too can raise these easy-to-care for, vivacious freshwater fish. What Do Peacock Cichlids Eat? Is A Peacock Cichlid Right For You? Native to Lake Malawi, in the African Rift Valley, the Peacock Cichlid is just one of many types of Cichlids. It belongs to the Astatotilapia genus, and there are at least twenty-two different species of fish within the peacock category alone. These unique fish are known as peacocks because they have such a vibrant appearance. These fish occur naturally in freshwater lakes, where they tend to hang around areas of sandy or slightly rocky substrate. They are interesting in that the males defend a small territory against other mature males, while foraging females and non-breeding males form large schools. They are found in waters up to 82 feet deep, and tend to breed when the waters warm up each year. The cichlid family is one of the most rapidly evolving species of vertebrates. Single species of Cichlids evolved into over 500 new species over a period of one million years. This might seem slow, but when compared to other animals (like primates) who evolved into only a handful of species over the same amount of time, these fish should be revered for sure. These fish come in a variety of colors, blue to red to yellow. The one thing the Peacock Cichlid has in common with others of its species is that it will always be colorful, and the star of your aquarium. 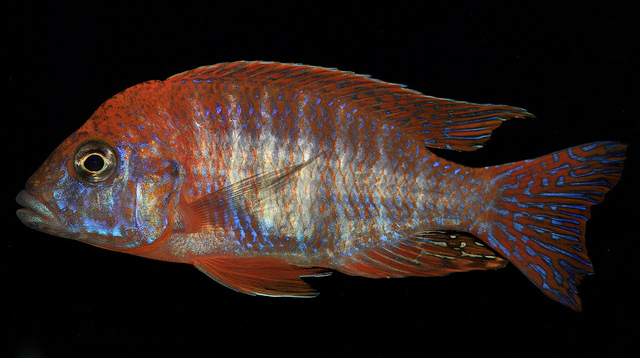 The blue Peacock Cichlid is perhaps the most common coloration, although it is easy to find other patterns and variations as well. 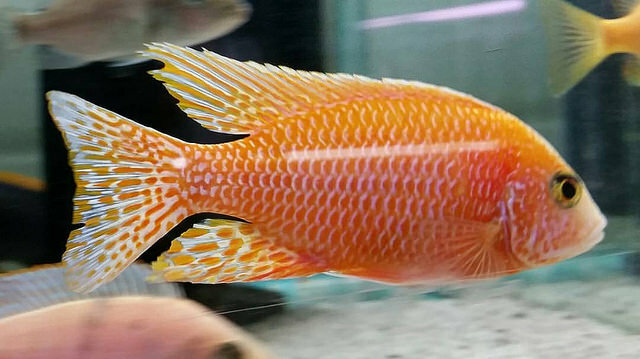 You can even find Peacock Cichlids in shades of gold, orange, and yellow. Peacock Cichlids have an iridescent color and are distinct from other Cichlids in that their color is permanent. Other types of Cichlids may change color depending on their mood and breeding behaviors. 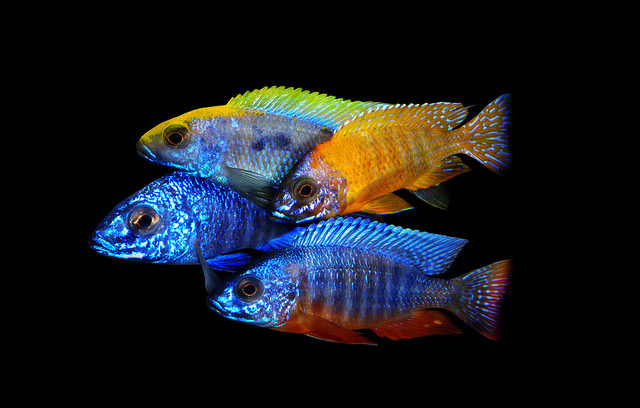 While there are multiple different types of Peacock Cichlids, all stay the same color throughout their lives. These fish grow to about six inches in length, with females being slightly smaller than the males. Cichlids in general have a reputation for being nasty and aggressive toward other fish. However, the Peacock Cichlid truly sets itself apart in that it is relatively peaceful. Although males can be territorial when their space is threatened, Peacock Cichlids make good community fish in general. In Lake Malawi, the ninth largest lake in the world, Peacock Cichlids are generally found at depths from about six to forty meters. As a result, they display a unique behavior in captivity in which they hunt for food amongst the sand. To do this, they will hang out just above the substrate of your tank. Once they detect movement, they will strike. Although you likely won’t have any invertebrates in your tank, they will still watch carefully and attack anything they detect on the bottom of the tank. An active swimmer, the Peacock Cichlid is an entertaining fish to keep in your aquarium. They are benthic, meaning they prefer to live in the lower regions of the water column. Here, they will sift through the substrate for food. Therefore, sinking pellets or granules are a good choice for Peacock Cichlids, as they will spend a great amount of their time looking for snacks in the sediment. The primary difference between the multiple types of Peacock Cichlids is in their coloration. The color varies depending on the region of Lake Malawi from which they are native. Juvenile males and all females of all types tend to be a drab gray. If you want to add color to your tank, make sure you add at least one or two males. There are roughly twenty-two different types of Peacock Cichlids, but many of these are not traded in the aquarium industry. 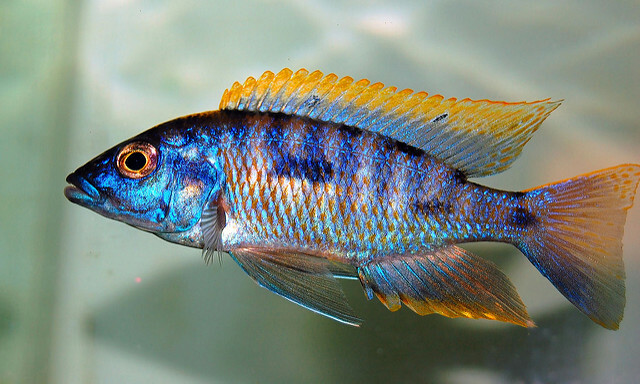 The most popular aquarium species of Peacock Cichlids are the African Butterfly Peacock, the Red Peacock Cichlid, the Blue Peacock Cichlid, the Sunshine Peacock, the Flavescent Peacock, and the Nkhomo Peacock. The Red Peacock is unique in that it is actually a sub-variety of the Flavescent Peacock. A man made creation, this fish is not naturally occurring. 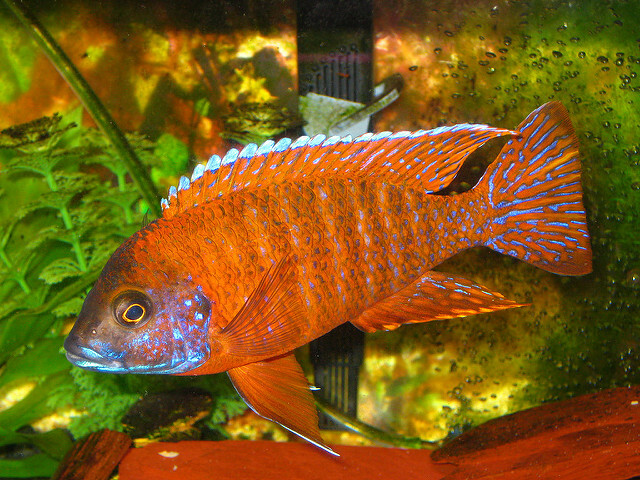 It is of the same size and personality type as other Peacock Cichlids, but has a deep red coloration. 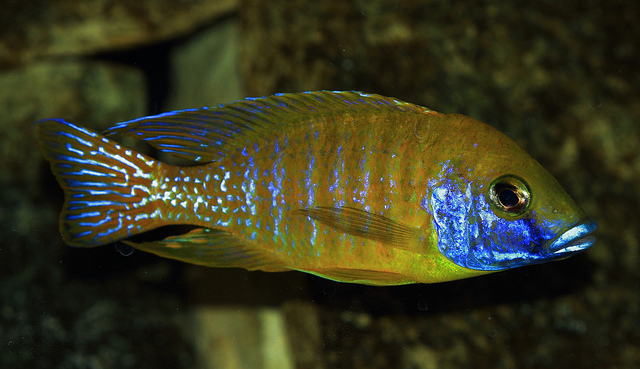 The Blue Peacock Cichlid comes in a metallic blue color but can also appear in shades of yellow, and during breeding season its colors will become more pronounced. You should do your best to replicate the Peacock Cichlid’s native environment when you are setting up its tank. Peacock Cichlids are native to Lake Malawi, where waters are slightly alkaline but exceptionally clear. These waters are incredibly stable in regard to pH and temperature. A fifty-five-gallon tank is ideal for a Peacock Cichlid. If you plan on keeping more than one or two Cichlids, go with a larger tank – ideally one that is more than one hundred gallons. The larger the tank you have, the fewer aggression issues you will need to deal with. Horizontal tanks are best, as they give your fish plenty of open space to swim about. You also want to provide your fish with plenty of room to swim about, along with a sandy substrate and plenty of loose rocks. Peacock Cichlids, as previously mentioned, like to sift through the rocks. Therefore, using gravel is a definite mistake, as it can cut their gills. Instead, use sand, and position the rocks to create caves and hiding spots. 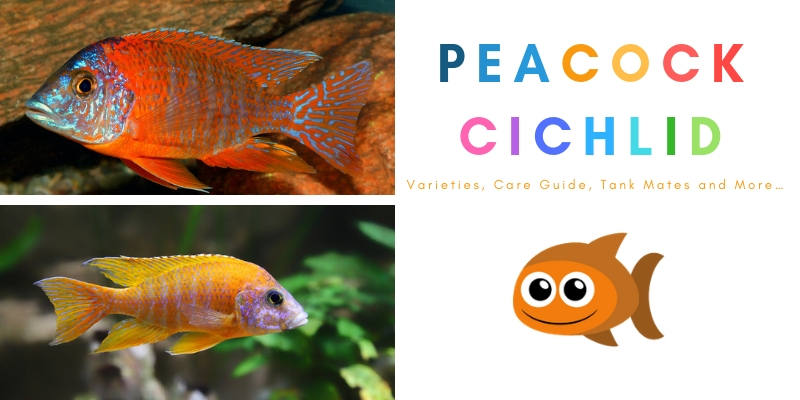 If you are mixing several varieties of Cichlids or peacocks, make sure you do some research on the conditions preferred by each individual species. Some prefer rocky environments, while others like sand, meaning it may be difficult to please all of your fish at once. If you keep your fish in a larger tank, it will be a bit easier to adjust your parameters as needed. Keep the temperature of our tank warm, around 76 to 82 degrees Fahrenheit. The pH should hover between 7.8 and 8.6. Because the Peacock Cichlid’s native environment is not subject to huge swings in temperature or pH, you need to make sure your water conditions remain as steady and consistent as possible. Peacock Cichlids tend to live in rocky and sandy areas. Therefore, you should mimic this environment in your aquarium to reduce overall stress and make it easier for your fish to adapt. Providing plenty of sandy substrate and decorations is essential. Peacock Cichlids can be territorial, though not aggressive, so providing plenty of caves and other hiding spots in your tank is a good idea. Not only will it give the fish places to hide, but it will also help disrupt and break up any aggressive behavior. Peacock Cichlids do not eat live plants, so you can safely include live plants in your aquarium without having to worry about them disappearing. A word of caution, however, as Peacock Cichlids like to dig and move plants. Therefore, you should only use hardy plants like Java ferns or anacharis, and make sure you anchor them securely to the bottom or sides of the tank. Peacock Cichlids are voracious omnivores, eating both meat and plant matter in the wild. They are bottom dwellers, known to sift through the substrate for food like insects, zooplankton, larvae, and crustaceans. In the aquarium, you should provide your Peacock Cichlid with an equally varied diet. 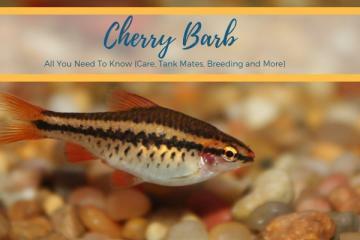 For example, you should begin by finding a quality cichlid pellet or flakes. This should become the core of your Peacock Cichlid’s diet, and you can then supplement the rest of their diet with meat and vegetables. Popular sources of meat include live or frozen brine shrimp, as well as frozen daphnia frozen. Avoid any meat from mammals as well as most worms, as these can cause a unique cichlid-specific disease caused Malawi bloat. Feed your Peacock Cichlid several times throughout the day. Ideally, you should feed two or three times. This will help maintain good water parameters, as Peacock Cichlids likely won’t be able to eat large portions at one time. Peacock Cichlids are one of the few types of Cichlids that can cohabitate well with other types of fish. They do not share the reputation of being aggressive as other Cichlids do, and are significantly more peaceful. When selecting potential tank mates for your Peacock Cichlids, make sure the fish you choose can survive in the same conditions. Botia loaches are common tank mates for Peacock Cichlids. They are semi-aggressive but they like to hide. Because you will likely already have plenty of hiding spots for your Peacock Cichlids, this will be an ideal environment. The red tail shark is another popular tank mate. They are gorgeous to look at and can be territorial, but also like plenty of rocks and vegetation. Plecos are commonly kept as companions with Peacock Cichlids because they are bottom feeders who will help to keep your tank clean. These feeders will usually stick to the bottom of the tank and stay well out of your Peacock Cichlids’ way, improving the water quality and keeping to themselves as they do so. 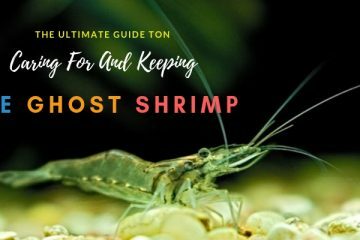 Try to avoid keeping other algae eaters, like shrimp and snails, out of your tank. Peacock Cichlids can sometimes confuse these peaceful individuals for food, and that can lead to injury or death. You should also avoid keeping your Peacock Cichlids with super aggressive species like discus fish and angelfish. Keep in mind that you can also keep multiple Peacock Cichlids together, even those from different groups. 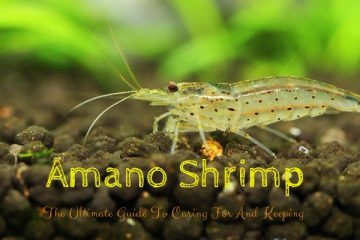 This is a great way to add color and diversity to your aquarium without having to worry about any potential conflicts. An ideal ratio is one male to four females, which will help create natural schools and help prevent aggression among the males. As a member of one of the largest families of freshwater fish, Peacock Cichlids are prone to developing several common aquarium fish diseases. At some point, it is likely that your Cichlids will get sick. Luckily, many of these are easy to treat. Swim bladder disease is one of the most common issues in Peacock Cichlids. Its is when the swim bladder, the abdominal sac lined with epithelium that helps a fish stay afloat, is infected or damaged. This can be caused by external trauma from fighting or accidents, or from secondary disease like cancer or tuberculosis. A poor diet or constipation can also bring on swim bladder disease. Adding more fiber to your fish’s diet can help relieve symptoms of this disease if it is caused by poor nutrition or constipation. Malawi bloat is another common diseases, caused by poor water quality and stress. This disease causes swelling in the abdomen, as well as a loss of appetite and lethargic behavior. It can lead to fatal liver and kidney damage if left untreated. Maintaining good water quality is of the utmost importance when preventing this disease. Hole in the head disease sounds terrifying, but in fact it is quite common among Peacock Cichlids. It presents as a slight depression in the head, accompanied by symptoms like infection, loss of appetite, and weight loss. It is typically caused by poor water quality, but can also be influenced by mineral imbalances and parasites in the water. 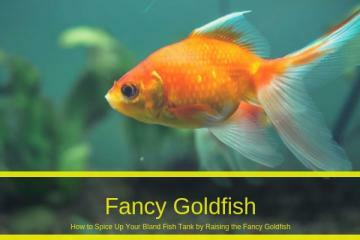 You will need to improve the water quality and diet of your fish and then treat the tank with an antibiotic. Ich is another disease to which all aquarium inhabitants are susceptible. This disease is easy to identify, creating small white dots on the gills, body, and fins of infected fish. These are the most obvious signs, though others include clamped fins, lethargy, poor appetite, rubbing behaviors, and labored breathing. This disease is highly infectious. If you notice one fish has fallen ill, make sure you isolate it as soon as possible so that you can treat the infected fish without impacting your other fish. Male peacocks, owing to their territorial nature, tend to be more solitary than females. As a result, it can be a bit challenging to breed Peacock Cichlids – though certainly not impossible. The first thing you need to do is to ensure that each male has his own territory to prevent breeding-related conflicts. Otherwise, they are easy to breed. Start by raising the water temperature to the upper end of the range, usually around 82 degrees Fahrenheit. This will encourage spawning behavior, which normally occurs in warm water. Then, the courting process will begin. This is quite fun to watch, as the males will perform for the females, making quick, attractive movements to lure them into the caves. Once inside the cave, the female will lay eggs into the nest. The male will fertilize the eggs and the female will then collect them in their mouth. She will keep the eggs in there until they are ready to hatch – usually up to twenty-eight days. When the eggs hatch, you will likely see twelve to fifty new Peacock Cichlids. Peacock Cichlids are more low-maintenance than other types of fish in that the females and males alike will usually leave the young fry alone. Although they don’t provide much support in the early stages of life, you also don’t have to worry about cannibalistic behavior. Peacock Cichlids are some of the friendliest and easiest-to-care for cichlid species. Offering stunning coloration and enjoyable behaviors to watch, they are one of the most popular fish species you can keep in your freshwater aquarium. Peacock Cichlids are strong and resident to many diseases. Although they are often regarded incorrectly as “killer fish,” Peacock Cichlids, like all other Cichlids, may be somewhat aggressive but do not kill everything in sight. These fish can be downright friendly, and it’s even possible to train some intelligent individuals to eat right out of your hand when they swim to the top of the water! 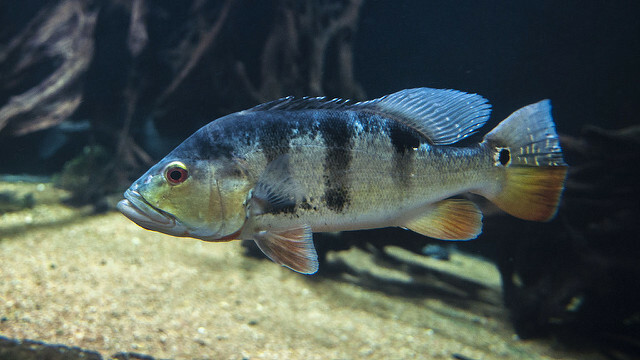 Regardless of whether you are a novice or more experienced fish keeper, you should consider giving the Peacock Cichlid a try. As long as you can provide plenty of space as well as rocks and other hiding spots, the Peacock Cichlid will be perfectly content in its new home, providing you in turn with years of enjoyment. 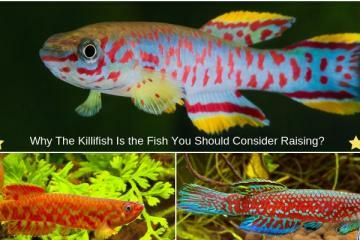 Why The Killifish Is the Fish You Should Consider Raising? How to Raise the Glass Catfish in Your Freshwater Aquarium? Why The Harlequin Rasbora Is The Fish You Need In Your Tropical Tank?